I am constantly surprised by the difficulty that many people have in striking dou correctly. Because it works best as an oji waza they wait until their opponent makes a men attack and attempt nuki or kaeshi dou. In most cases they wait too long and hit when their training partner has entered their distance. The result is that they either strike the front of the dou or have to push both hands over to the right so that there is no power behind the strike. In either case it is a waste of time and effort as neither is classed as yuko datotsu. The other common misconception is that dou is a diagonal cut. This probably was the case when cutting with a katana. The objective was to cut from the armpit to the hip. If however you try this with a shinai it simply slips down off the target. When combined with late timing and too close distance the result is hira-uchi, striking with the side of the shinai, which is probably the worst sin that you could commit in the long list of crimes against correct dou. Coming back for a reality check, we need to hit the correct target with the correct part of the shinai with correct intention and “high spirit” followed by zanshin. In my view this means giving the side of the dou a good whack with the datotsu bu of the shinai ensuring that we hit with the bottom take. To do this you need to be in front of your opponent at the time of the strike and consciously punch forward with your right hand whilst turning your wrist sharply inwards. Your left hand should be more or less in line with the centre of your body. 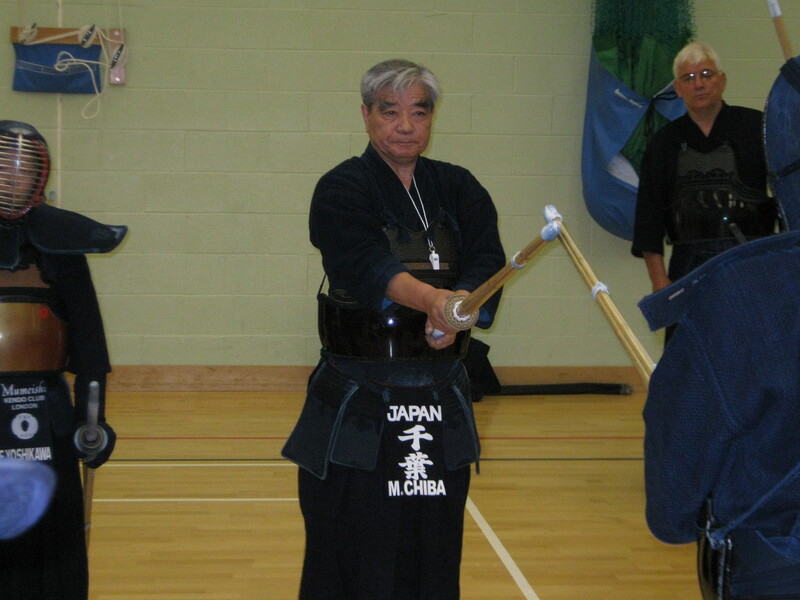 Only after you have done this should you think about breaking your grip on the shinai and moving through diagonally. 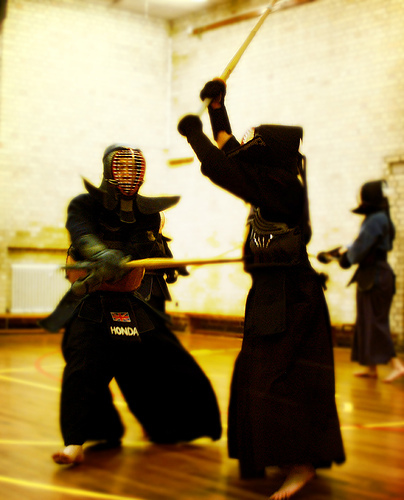 It is also essential to keep your eye on your opponent and to retake kamae as soon as you are in safe distance. One of the excuses often given for cutting dou incorrectly is that the opponent moved too quickly and did not allow us the distance to get it right. The way to avoid this is as with all successful oji waza, we should control the timing of his attack by maintaining and the breaking pressure when we want him to move. This and the flexibility of your right wrist are the keys to success. There is an exercise developed by Chiba sensei that helps you gain this correct cutting action. You practice yoko men or dou suburi, but do so turning your hands inwards on each stroke so that the path of the shinai is horizontal or parallel with the floor. It is a way to gain the wrist flexibility that you need to make your dou attack effective. Sumi sensei stopped over at Mumeishi dojo on his way from Edinburgh to the Ukraine. He spent the first hour of the two hour session taking everyone through a kihon lesson that yet again demonstrated his unusual, creative approach to teaching the basics. This drill was geared to taking the students through the permutations of distance and timing for shikake and oji waza. 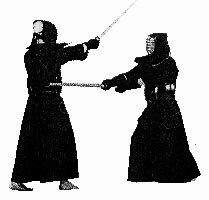 With everyone working in pairs with shinai and without men and kote, he started with what he called “shadow hitting”; both partners facing each other from opposite sides of the dojo and moving forward with a big approach step and striking men with fumikomi footwork, This was done at a distance where neither partner came near to each other. The exercise was then repeated with a small approach step and then a medium size step. The size of the cut was then changed to reflect the approach step; big step, big cut; small step small cut and so on. After both partners had worked through these permutations in turn, sensei brought them together and had motodachi run through the sequences from the necessary distances to strike men correctly. Kakarite was asked to respond with nuki dou. Emphasis was put on striking the correct part of the target and using hiraki-ashi. The drill was then expanded to include oji-kaeshi dou, men suriage men and men suriage kote. As people tried this it was pointed out that an active right hand was important to make the suriage effective and that suriage only works if your hands are in the centre of your body and you do not bring the point of the shinai back towards your face. Each pair was then instructed to move into issoku ito mai and shown how to make kote kaeshi gote. This is a particularly difficult technique to achieve because of the need to create distance between blocking the cut and making your own strike. 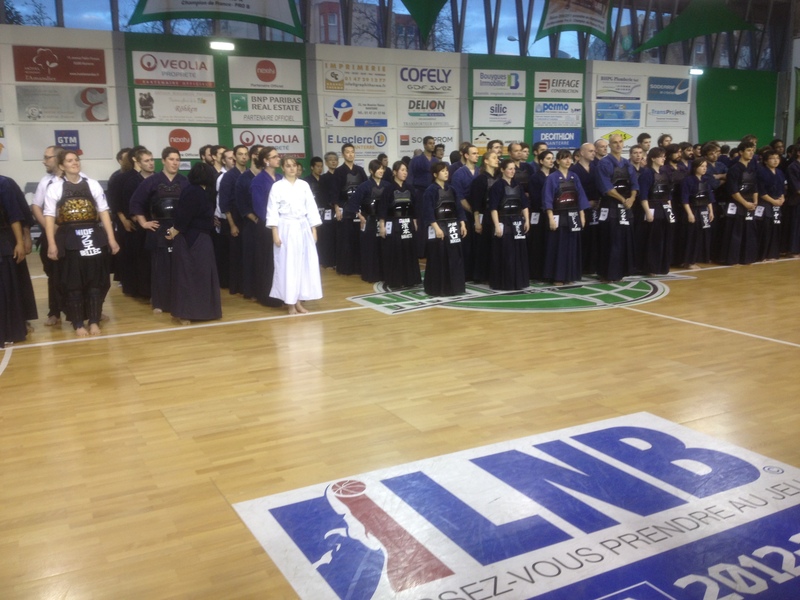 Sumi sensei made the point that you need to show your kote to prompt the attack and then block and return. If you start by showing the omote side of your shinai your opponent will not attack. It is a lesson that takes a lot of concentration and on a hot evening people were sweating heavily even before putting on their bogu for keiko. There was an obvious improvement in most of the participants in the hour that they had been practising. With Sumi sensei’s permission, I may steal this drill and use it in some of my own lessons. Events like this are great opportunities to catch up with old friends, and in Paris there is the added bonus of good food and wine to finish each day. From a referee’s perspective, it is interesting to work in different environments with referees from other countries. Although of course, wherever you are, the basics of judging yuko-datotsu do not change. Referees on my court were from France, Belgium, Japan and the UK. Over the two days we raised our flags for hundreds of men and kote and quite a few tsuki ari. We also saw numerous attempts at dou for which we gave only one ippon. Talking this over with my colleagues, the reasons for not awarding a point to most dou attacks, is that they do not have correct hasuji, or they hit with the wrong part of the shinai. As with men and kote, it is essential that the datotsu bu of the shinai strikes the correct part of the target. That is to say the top third of the jinbu should hit the right side of the dou with the bottom take making contact. Most of the unsuccessful attempts we saw were “hira uchi”, where the side of the shinai hits the dou. There were also a number of occasions where the front of the dou became the target. Normally this is not intentional, but happens because the cut is made as the opponent is coming forward and there is not sufficient distance between you. My pet theory as to why so few dou succeed is that most people view kaeshi dou or nuki dou as a reactive technique. If your opponent has already launched his attack and you attempt dou, you will be too close to complete the technique successfully. If on the other hand you force him to attack men and then hit dou just as he starts his attack, you should be able to hit the correct part of the dou with the right part of the shinai. It helps to think about punching forward with your right hand while directly in front of your opponent and in turning your right wrist in so that the bottom take connects. Then you can move elegantly past your opponent and watch all three flags go up.